An Auburn real estate broker, who authorities say helped bring about the 2009 failure of Westsound Bank, has been extradited from Moldova to face charges, according to the Seattle Times. Galina Kravchenko and her husband Aleksandr were indicted on charges of conspiracy, bank fraud and money laundering in 2009. 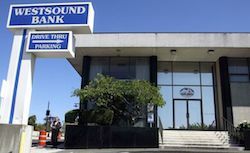 Authorities believe the Kravchenkos and their associates conspired to obtain more than $49 million in fraudulent construction loans from Bremerton-based Westsound Bank, prior to its seizure by regulators. The Times reports the Kravchenkos fled to Moldova in 2008. Aleksandr remains at large. The FDIC sued former Westsound Bank directors for negligence in 2011. The case was settled a year later.